Oh, la la! Good News to all entrepreneurs! The Philippine Retailers Association (PRA) highlights why shopping is more fun in the Philippines during its 21st National Retail Conference (NRCE) and Stores Asia Expo. This 2-day conference and exhibit is usually attended by over 800 retail owners, suppliers, CEOs, and top level executives. For this year, NRCE invites experts from the retail industry and other related sectors to cover relevant aspects of retailing. NRCE, the country's biggest retail industry event, joined forces with the government's It's More Fun in the Philippines campaign, as it invites tourism Secretary Ramon Jimenez to speak on the campaign's synergy with retail industry growth and more fun shopping experience. Adding to the prestige of the event is Coca Cola’s President and CEO William Schultz who will be the keynote speaker on the opening day of the conference. Coca Cola, which celebrates its centennial year this year is among the well-loved brands in the Philippines. Coca Cola’s participation in this year’s NRCE is expected to further elevate the “fun” aspect of the conference as the brand celebrates “100 Year of Happiness”. This year’s NRCE highlights are strategies for driving growth and customer engagement. To register simply download and fill up the form here! 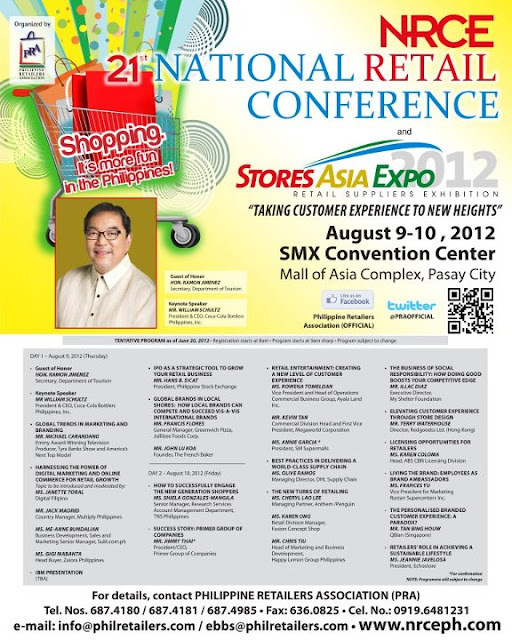 The topic that interest me the most in this upcoming NRCE 2012 Conference Program is Harnessing the Power of Digital Marketing and Online Commerce for Retail Growth. As everyone knows we are in the Digital Age. Most of my peers don't buy newspaper or watch TV anymore. My friends read the news online and watch you tube instead. They always sign in and read news feeds from their Facebook walls. This could only mean one thing. Establishments in order to keep up with the times must put up an online presence. Nowadays, it is common to find establishments with a fan page at Facebook. You are not "in" if you don't have fan page or a domain which will make your store's online presence stronger. There's plenty of room for improvements in the retail sector in the Philippines. In the future, I would be thrilled to see and use the innovative NFC( Near-Field Communication) card to pay for food and transportation purchases. I like how fast and easy the retail transaction using NFC cards like the card that was introduced to the market by a fast food chain, very similar to Hong Kong's Octopus Card, and the Top Up Card of Singapore. A customer just need to tap their cards and voila, the transaction was done already. So don't be left behind! Harness the power of Digital Media today! Good news indeed! Finally, something to look forward to for the businessmen at home. This looks like a really great seminar! Especially for my mom, will definitely tell her about this one. This is another interesting conference that as a retailer like me must attend. Another venue for networking! Such an awesome events for students and teacher. Everyone that has the time should really join.